This is the worst thing that could ever happen in this country. Free labour for any business or organisation who requires it. What is the matter with people? why aren’t we up in arms over this? It’s full on slave labour. People are too busy moaning and groaning online. One day the government will switch off the internet and the sheep will be totally clueless and lost. People have to get out there and scream and shout. 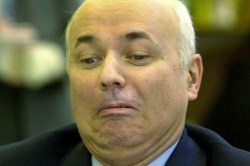 The employed are the ones in favour of getting the jobless into workfare. They are too dumb to realise that the jobless are putting the employed out of work. People think i’m crazy when I tell them what is happening. This man has no idea how most of us live, i an on benefits, and have just had my disability taken off me, But what the paper and media don’t point out is that before i became so ill, i worked my socks off to bring up a child, i did not take hand outs, i worked so hard and enjoyed doing it, but the it was all at the cost of my health, i have a life threatening illness that i was born with, i moved from the North of England to the South , so i could carry on working, and now when i need help and support the likes of this man has the cheek to treat people like scum, you high and mighty prick.